Some positive updates from SSfS…yes really! Given the recent decision taken by the Scottish Government to dismiss the need for a Public Local Inquiry (PLI) and grant consent to Dersalloch Windfarm, thus overriding the ‘open and transparent’ planning process, the local council, and some 5000 members of the public who objected to it, there has not been much to cheer about in recent weeks. A sinister precedent has been set which has left the surrounding communities and councils in shock, not just at the way the decision was made and the timing of the announcement, but also as to what this could mean for the other Section 36 windfarms surrounding Straiton which are currently in the planning system (not to mention countless others all over Scotland). Legal advice is being taken as we speak so hopefully we have not heard the end of this, however we thought in the meantime we could try and cheer our supporters up with some ‘better’ news. 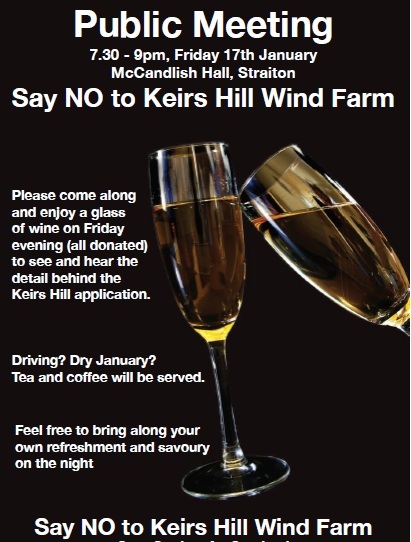 Keirs Hill Windfarm (RES UK) – In addition to a solid objection by South Ayrshire Council, there are confirmed to be 3419 public objections to this proposal. Last week, East Ayrshire Planning Committee added theirs to the mix. This ‘should‘ trigger a Public Inquiry, however, who knows how the Scottish Government will choose to handle this given their recent behaviour with Dersalloch. East Ayrshire have provided a full and detailed review with their reasons for objection, and even hired their own noise and landscape consultants to assist with the decision making process – the report can be found here. Sadly, developers RES have already been throwing their toys out of the pram about this objection, with the decision having been reported as … “blasted by applicants RES UK and Ireland Ltd who claim the development will boost the economy and create local jobs”…“The Council’s decision will create significant additional costs and delays, for all parties, in the delivery of the proposed 17 turbine development which has received no objections from Scottish Natural Heritage, SEPA or Historic Scotland and has significant support within the local community.” Well RES, we did try to warn you that this was an inappropriate development and the Council are perfectly entitled as statutory consultees to object! Many developers mistakenly seem to think that because SNH do not formally ‘object’ that a proposal has essentially got the ‘green light’. This has never been the case, as there are many other considerations that need to be accounted for, and yes RES, that does include impact on communities and breaches of planning policy! 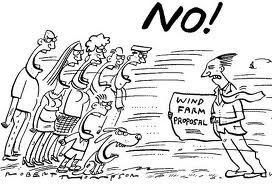 No news yet for the Linfairn addendum (removal of 6 turbines), however, Willowind are another developer that mistakenly believe it is only SNH who have a valid opinion and from their recent ‘exhibition’, it is clear that they do not consider the other objections made by the landscape, planning and noise consultants, or the 6000 public objections relevant. So they are going to push ahead with some very superficial changes to try to appease SNH. We wish them all the best, look forward to responding to the addendum and hope that Mr Atwal is enjoying his sabbatical from his banking day job to try and push this proposal through! As you may be aware, SSfS received an extension for the Keirs Hill representation (well there was a lot to say about it!). This ensured that there was plenty of time to enlist the help of Landscape consultant Mark Steele, as well as pull our own objection together. These were submitted to the ECDU on Friday (7th Feb), and the documents are now available online for you to view. We have also included the submission from VisitStraiton, which we hope you’ll agree makes good reading! Unfortunately Glenmount is in full flow, so no time to dwell on Keirs Hill. Developers RWE npower have already been giving us a bit of a headache, and that’s before their 36,000 vehicle journeys get near us! Both the Community Council and SSfS, following a lot of concern from local residents asked for a public meeting to be held so people could raise their own issues and hear what they had to say. RWE responded to this by selectively inviting some residents to an ‘appointment only’ discussion on Friday 14th February. This is far from ideal given most people on the route would have been unaware about the invitation. If anyone would still like to try to get an appointment, RWE can be contacted on 0845 717700 or emailed Glenmount@npower-renewables.com. Failing that, however RWE have now agreed to hold a further drop in session in the McCandlish Hall on Tuesday 18 February between 4pm and 7pm (they really don’t want people to turn up at the same time do they?!). It is imperative that anybody to has concerns or questions about the proposal to try and make it along to the drop in session and make sure you get all the answers you are looking for. RWE have provided a traffic management plan which has some basic information so please have a look prior to going along just to give you a feel for what they are proposing. With over 36,000 vehicle journeys passing through Kirkmichael and Straiton over a 20 month timeframe, including thousands of HGV vehicles and abnormal loads with police escorts, You may well be very concerned about delays, parking, vibration damage to properties, emergency access, not to mention the roadworks that will take place prior to the construction traffic in order to upgrade the route so it can handle these vehicles. How do they propose this traffic will be co-ordinated with Linfairn (40,000 journeys via Crosshill) and Dersallach (a similar number via Kirkmichael)? Whatever your concern, please turn up and make sure your voice is heard and your questions are answered. “Please note, the application for the Keirs Hill Wind Farm has not yet been submitted and the Environmental Statement is not available for viewing. The advert in Ayrshire Post (dated Friday 22nd) was placed in error. SSfS do not have details of new dates yet but will provide them as soon as they are available. Linfairn update – time is up! SSfS Chairman, Bill Steven spreading the SSfS message at the ECDU offices! Well, the last few days of the Linfairn campaign saw an immense push and those final objections literally came flooding in! We don’t have the official count, but there are believed to be over 3000 individual objections that made it to the Energy Consents Unit by Monday 11th November! A huge thank you to everybody who took the time to make their feelings known – for a community the size of Straiton to see such support has provided a fantastic boost to this campaign and has really impressed politicians, fellow campaigners, and the local media. There will be a bit of a wait now as all the statutory consultees have to prepare their own responses to the application, but we will keep feeding back information as it becomes available. This is only the beginning, there is still a big hill to climb, but we’ve certainly made a cracking start thanks to all your fantastic support. Linfairn objections – time is running out! We’re running out of time … Object Now to Linfairn Windfarm! Well this has been an excellent campaign so far! Our supporters have really pulled out the stops and objections have been, and are still flooding in from far and wide. We have also received the reports prepared by our planning, noise and landscape experts. Unlike the WilloWind submission, these reports are accurate, detailed, and extremely encouraging! However – we only have 3 days left so please use them wisely. If you haven’t already, make sure all those friends, family, neighbours, or workmates who have expressed concern about our plight have an opportunity to have their say..
Those people further afield can sign the template letter and submit it directly. More postcards can still be obtained from The Buck or printed online. More details on how to object can be found here. If you have any signed forms or letters to return, please hand them into The Buck before Monday 11th November. Don’t underestimate how crucial these last few days are – be assured we have the arguments – but we need to make sure the numbers reflect the strength of feeling against this Windfarm. Lets pull together for this last stretch and kick this ridiculous planning application straight back to those greedy investors in London and Switzerland and show them we mean business! Well folks, at last, our investment bank led developers, Willowind, have finally confirmed through the Carrick Gazette that they will be submitting their Linfairn Windfarm planning documents to the Scottish Government, Energy Consents Unit this Friday (27th September). The full article can be viewed here. It has been a busy 8 months for them, sorting out their ‘single site’ access route, and liaising closely with the local community in order to revise the plans (which still appear to contain the 25 turbines cited in their initial scoping documents). Martin Davie from the Willowind project team commented on how it is ‘…especially pleasing to have had such active involvement from local people in getting the plans to the application stage – we’ve gone to great lengths to respond to the issues raised with us about this development, and have included a number of measures in our application which we believe fully address them.’ At SSfS we very much look forward to seeing the revised plans and preparing our responses to these. In the meantime, please keep an eye out for further posts regarding next steps. As per the presentation last week, we will be preparing letters and templates to help people with their objections. The final objection date is the 11th November 2013. Planning application documents will be available for public viewing at South Ayrshire Council planning office and Maybole Library. Please also feel free to leave a comment on this post if you have been party to any of the mystery communications with Willowind that have addressed your concerns, and that you would like us to consider when preparing our own submissions. Tune in to Radio Scotland tomorrow morning for an interesting debate. Kaye Adams asks ‘if you are ready for more wind farms’. This is in response to the recently published Audit Scotland report which suggests Renewable power “needs to double” to meet the 2020 targets. She will be joined by the Energy Minister Fergus Ewing. Scotland against Spin Chairman Graham Lang is also on call as is Scottish Tory Energy spokesman Murdo Fraser. This is the developer’s own shocking Photomontage taken from the Monument looking towards one section of the Linfairn Windfarm. You may have been wondering about the progress of Linfairn Windfarm given that considerable time has passed since the public exhibition was held back in January. At that point we were told final plans would be submitted around March 2013. The SSfS committee have been trying to contact the developers (Willowind) to pin down more detail regarding progress and timescales. 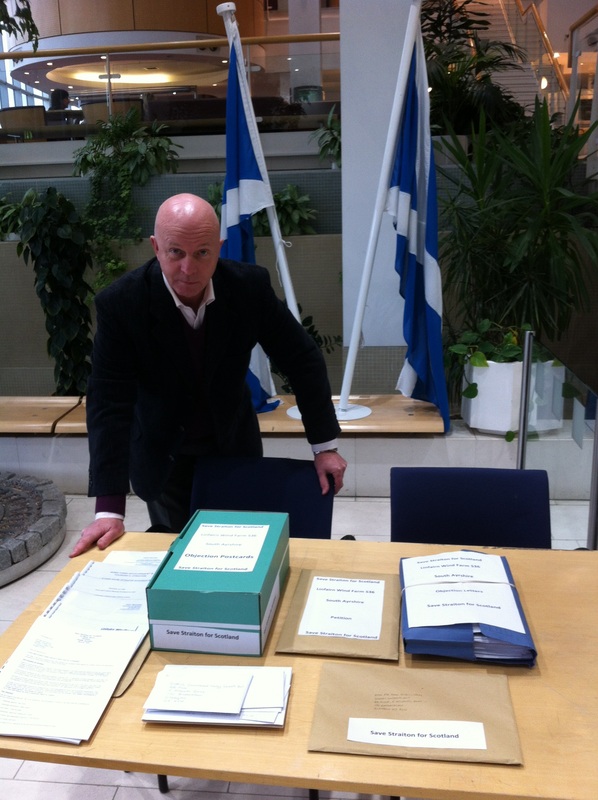 Last week, and thanks to Chic Brodie MSP, who has been liaising closely with SSfS, a meeting was held with Willowind. Our Chairman Bill Steven was allowed to attend with one other committee member. Below are the key dates which came out of the meeting. These are subject to change however, we wanted to share with you all as soon as possible and prepare everyone for the next steps. As this is a Section 36 (over 50 MW) application, Willowind plan to submit their application to the Energy Consents Unit part of the Scottish Government. Willowind also plan to give a full copy of their application documents to South Ayrshire Council, SSfS, and Maybole Library. Willowind to arrange for hand delivered leaflets to all local addresses (and email addresses) outlining the progress they have made over the last few months through ‘listening’ to local concerns and updating their plans accordingly ready for the next steps. Unlike other developers in the area, Willowind do not intend to hold a further public meeting to discuss any changes. However it is understood the 25 turbines still remain. 1st round of adverts will be submitted to the Glasgow Herald and Edinburgh Gazette / Ayrshire Post. 2nd round of adverts will be submitted to the Edinburgh Gazette / Ayrshire Post. Last date for public objections. Final date for South Ayrshire Council response – note it is very likely this will be delayed. There is going to be a lot of activity of the next few weeks, and we are all going to have to part to play in this. SSfS cannot do this without your support, so are holding a public meeting on Wednesday 11th September at 7:30 pm in the McCandlish Hall, Straiton. SSfS will take you through the plans for the coming weeks and give you an opportunity to ask any questions and highlight any concerns. If you are from the local area and support our cause, please make every effort to be there. 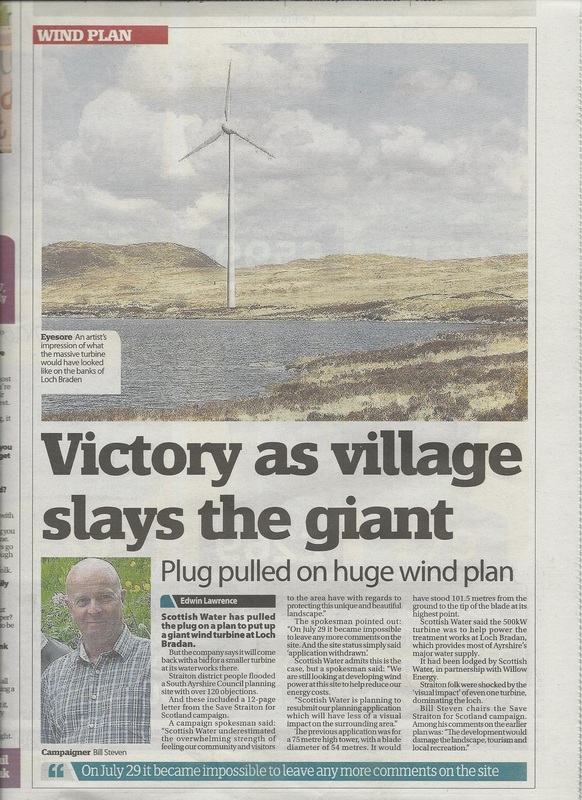 Village ‘victory’ makes the press! A good article in the Ayrshire Post this week highlights our first Save Straiton for Scotland ‘success’ at Loch Bradan. Well done everyone! Hopefully there will be several more to follow over the course of this campaign. Unfortunately the article isn’t available online yet but if you don’t have the paper – you should be able to read the article if you click on the picture to the left – you may have to magnify it slightly if your eyesight is anything like mine! 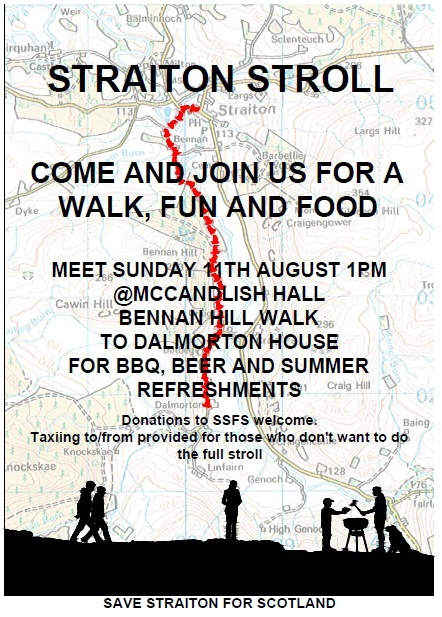 Dust off your walking shoes (or your wellies), come along to the McCandlish Hall and enjoy a pleasant walk up to Dalmorton House via Bennan Woods. Keen walkers can climb to the top of Bennan Hill to get a great view of the local hills, across to Ailsa Craig and to the mountains on Arran. There will be lifts for non-walkers so everyone can join in the barbecue, beer and summer refreshments. Donations to SSfS welcome. Hopefully everyone has been enjoying the great weather and getting out and about in the sunshine! In between sunbathing, the SSfS committee have been busy, and the campaign has been hotting up (sorry – couldn’t resist)! As there are a few updates and dates for your diary, we have produced an extra edition of our newsletter to highlight these. Those living locally should have already received their copy through the door, and those living further afield can download their copy here. * Important reminder … for anyone who is free tomorrow (24th July), there is a meeting in Dalmellington Community Centre at 10.00am where a Reporter will be present to hear evidence for and against a proposal to erect 8 turbines at Chalmerston. Last January it was recommended for refusal by East Ayrshire Planning Department. The developers however, have appealed against the decision. It would be fantastic if as many people as possible can turn up and show support for our neighbours in Dalmellington who overwhelmingly oppose this development. If you are able to attend – please arrive a bit earlier as as there is likely to be some TV and press attention and a good turnout always attracts interest. 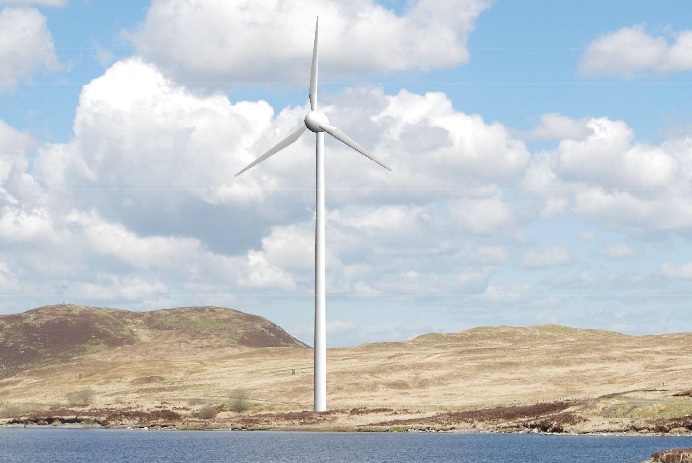 Loch Bradan turbine: Object Now! As you are aware a ‘surprise’ single turbine application sneaked into South Ayrshire Councils planning process last month. 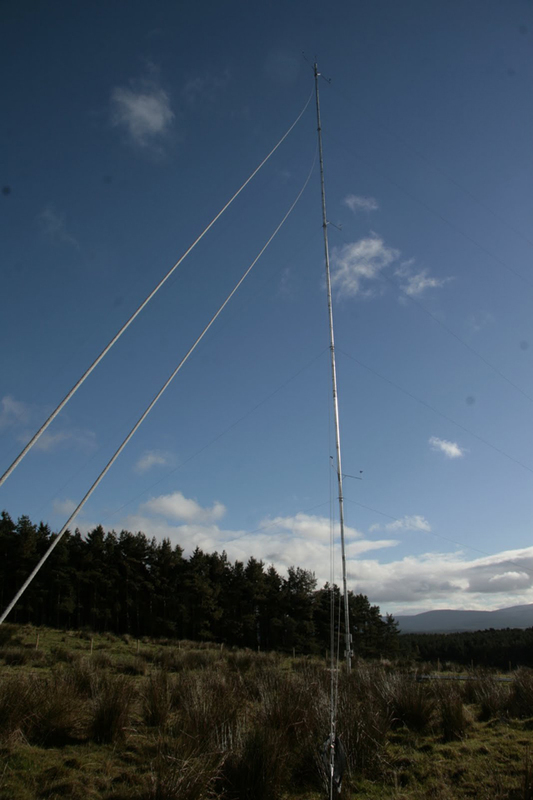 This was the application (13/00626/APP) from Scottish Water to erect a 101.5m turbine at the edge of Loch Bradan, and as you can see from this picture it’s not trivial! Timescales: as soon as possible – there is no specific deadline for objections, but it is likely to be decided around the end of July, at which time objections will no longer be accepted. One objection per individual in each household and if you have friends or family who understand what is at stake here, it would be great to encourage them to support us too. If you don’t know where to start or have any questions at all – just contact us and we will be more than happy to help. We understand some people do not have access to a computer and / or simply don’t have time to write a letter so look out for addressed leaflets that we will be distributing in the local area as well as having some in The Buck cafe for people to sign. Thank you all once again for your continued support and Happy Objecting! Around 30 birdwatchers travelled to Harris this week to view a very rare white-throated needletail, which breeds in Asia and winters in Australasia. One enthusiast who went to the Western Isles to view the bird told of his “dismay” after watching it fly into a wind turbine and die. The bird has only been recorded five times in the UK since 1950.